Regency: Ballycastle Chintz by Christopher Wilson-Tate. Hello! This is me holding the Regency Ballycastle quilt that inspired this collection. It dates to the 18th century. After the debut of the Regency Blues Collection for Moda at the 2017 Fall Quilt Market in Houston, I was so excited and full of ideas of what we could produce for future ranges from my archives and collection of Antique British Quilts that span the past 300 years. While in Houston for Market and Festival, I traveled to Moda’s Head Office in Dallas for the day. Cheryl, Jamie and I worked on what will be the second Regency Collection as I had taken a suitcase full of antique British quilts with me. I had a lot of fun while at Moda that day – this was and is still all very new to me, and I find the fabric production business to be quite fascinating. I have always loved this 18th Century Irish Chintz Patchwork so we decided that this should be the next antique quilt to reproduce. The quilt was purchased from a large country house in Ballycastle. At the time the quilt was made in the 1780-1790’s, this was Ireland. While Ballycastle is now located in Northern Ireland, it is still part of the United Kingdom and I always like to feel England, Scotland, Wales, Northern Ireland and Ireland are one group of amazing islands and peoples. 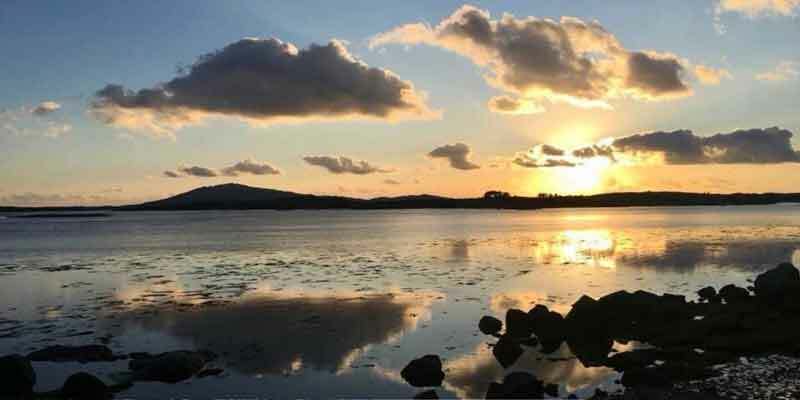 I love Ireland and Northern Ireland, the people are just wonderful, as is the hospitality. It is a very popular destination for quilt-inspired holidays and tours. 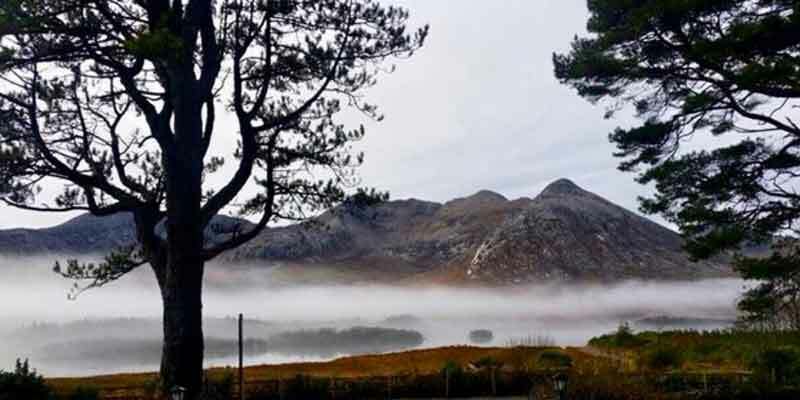 Ireland always feels a very mystical and spiritual place to me, with beautiful scenery and landscapes wherever you go. 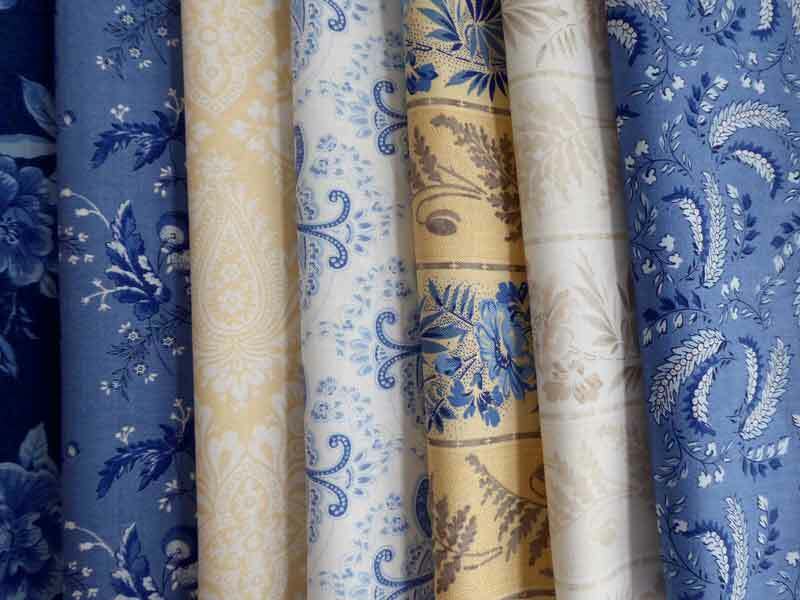 Throughout our hundreds of years of shared history and differences, we are all connected closely by our shared beliefs and values, and the new Regency Ballycastle Collection is in keeping with my idea of these collections being reflective of “Christopher’s Quilt travels around the British Isles”. Here are few teaser photos of the new collection – Regency Ballycastle. I absolutely love it and I hope everyone else will too. It is quite distinctive, inspired by a very unique 220-year old Irish Quilt. 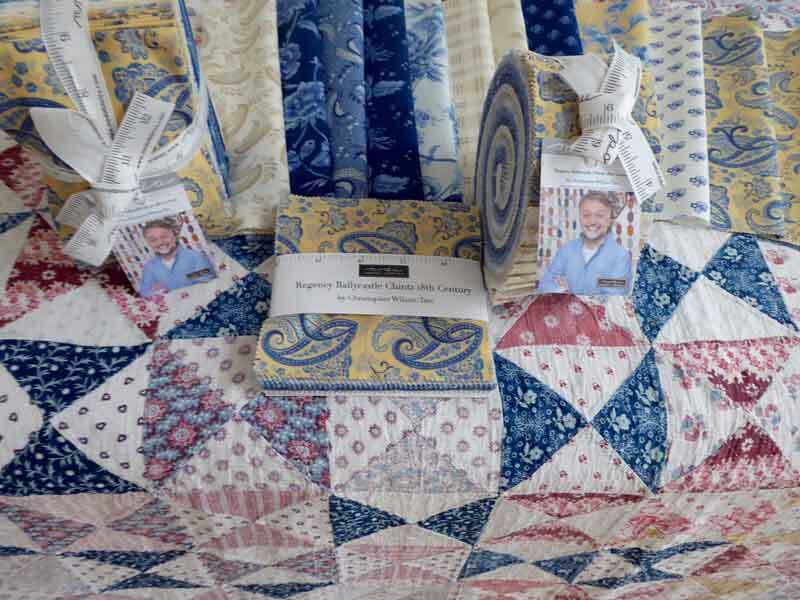 My friend Doug Leko of Antler Quilt Designs created three designs for a booklet – Regency Blues Ballycastle with a quilt and two smaller projects. This quilt is Ballycastle – it measures 56″ x 74″. Moda Fabrics also made two quilts with this collection. When Harry Met Meghan – the royal wedding was at the same time as Spring Quilt Market. This is Moda Cake Mix 11. If you were in Houston for Market or Festival last week, you might have seen my Special Exhibit – Antique Quilts of the British Isles. These boxes shipped several months ago and contained fifty-two carefully packed antique quilts. Moda shared a little bit of the exhibit here. 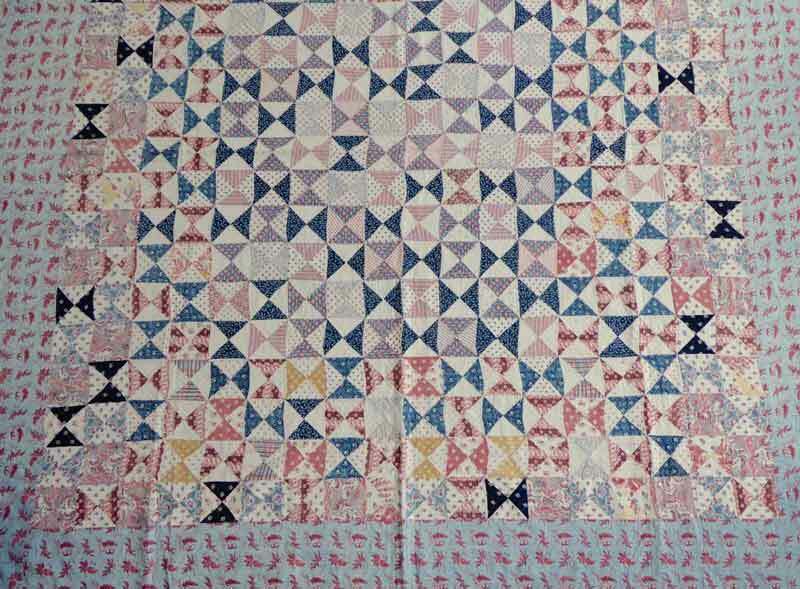 This English Georgian quilt is made with fabrics dating from the 1770s to early 1800s. It was hand-pieced and appliquéd. Fall Market also saw the debut of Regency Sussex, my third collection for Moda. This collection includes several shades of blue, brown, tan and gold. Doug Leko used the collection to remake several of his existing patterns, including quilts, wall-hangings and tablerunners. This is Holiday Blossoms from his Winterlude book. Moda also made a quilt, and this one will be available as a kit. It’s made with Moda Cake Mix 3. Thank you for letting my share my love of the British Isles and antique quilts with you. Beautiful! Even my husband loved the colors. I met Christopher at his shop when I was in London this summer. 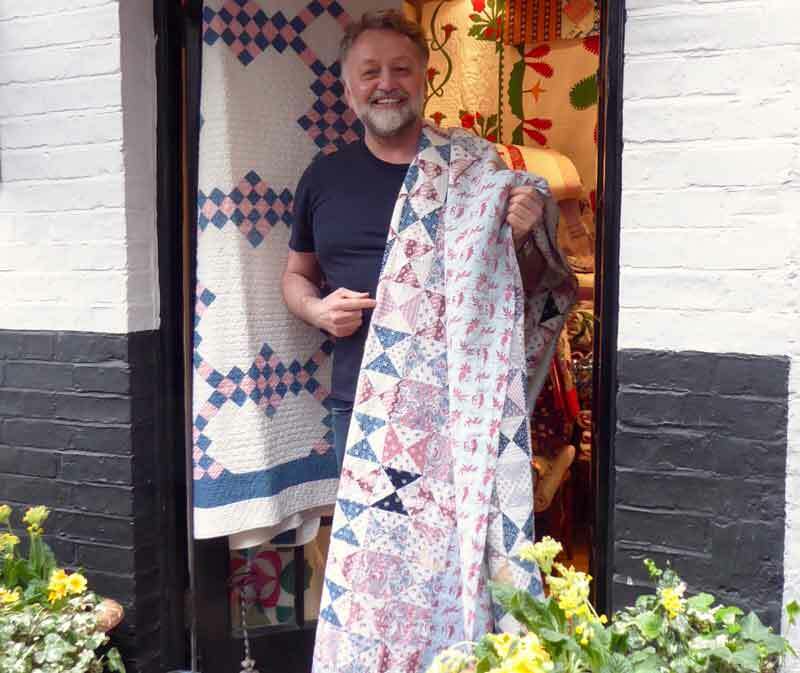 His shop is filled with wonderful quilts. He is so friendly, and I thoroughly enjoyed meeting home and seeing his fabric line. I am working on a quilt out of Regency Blues and will get Ballycastle as soon as it arrives in the store. Just beautiful! I too have a collection of antique quilts but mine were made in the US. Is it greedy to admit that I want it all??!!! These collections are SO my style! If money (& time!) was no object, I would outfit my entire home in them – furniture, windows, quilts – of course – even a bow tie for my dog!!! What beautiful fabrics you have designed! I will be eagerly awaiting the Ballycastle line! And, I agree with you about the wonderful people and places of the Republic of Ireland and Northern Ireland. I visited both countries last May and fell in love! I hope to visit again one day. (Your Ballycastle fabrics will make a wonderful memory quilt of my time spent in Ireland.) Thank you! So where are those delicious pinks and reds? Gorgeous. I love all of these fabrics. Thanks so much for sharing these gorgeous quilts, fabrics, pics, and interesting story! I’d love to make a quilt out of these beautiful fabrics and I’d love to travel to Ireland! 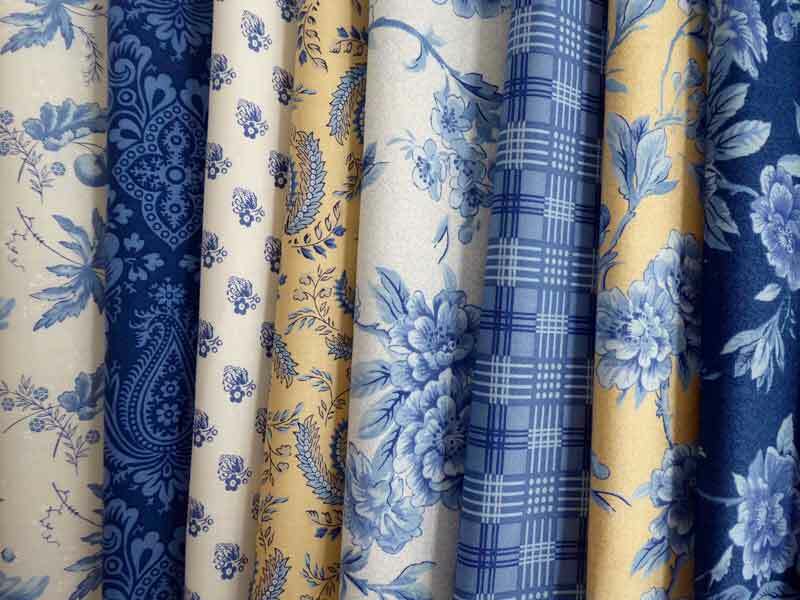 So glad Moda carries these fabrics and is bringing back the antique look – I’ll have to be on the look out for them! Wow, thanks for sharing the beautiful antique quilts! I love your Sussex collection. Soft and beautiful.